Who are the commuters and track stars of the future? Share your stories about getting the next generation on their bicycles. You need to be a member of Mums, dads and kids to add comments! This is a video of my boy balancing on his Strider bike. He only had it for about two weeks at that time and was 3.5 years old. Ride2School are running some exciting events at the BUPA Around the Bay Festival. Kids can also showcase their unique cycle style at the 'Cycle Chic' Bike Fashions on the Field Parade. Bought to you by the Rise2School program together with our friends at Melbourne Cycle Chic, participants will have heaps of fun and be in the running for awesome prizes from a local fashion desginer. Visit http://www.bv.com.au/general/ride2school/93585/ to find out more. 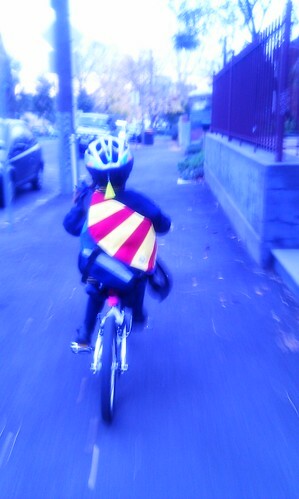 The "triple decker", our custom kid carrying solution. We get alot further now without carting a trailer. So, we took it very slowly, and under control. Footpaths she normally walks until we got to the quiet streets, and then she took to the road (for the second time ever - the first down the beach at Christmas).